It has been quite some time I've not baked scones and the last time I've made a batch of Sunflower Sultana Scones was last year. Hmm ... Made a quick batch of lavender and walnut scones for our weekend coffee/tea break ^-^! Aren't these star-shaped scones pretty ? My slightly modified version below as I've halved the recipe and yielded about 13 pcs. I did not make the glaze as I've got some butter and apricot jam for spread. Lightly toast the walnut for about 5 minutes in preheated oven at 170°C. Or until slightly browned and fragrant. Remove from the oven to cool completely. Chop coarsely and set aside. Pre-heat the oven to 200°C and position the rack in the center. Line baking sheets with parchment paper. Set aside. Using a clean cutting board and the back of a knife, grind or press the dried lavender into smaller pieces to bring out the essential oil and the fragrance. Whisk together egg and buttermilk in a bowl or jug. In a medium bowl, whisk together flour, sugar, baking powder, and salt. Add lavender. Next, rub the cold butter into the flour with your finger tips, lifting the flour from the bottom up on top, until the mixture looks like coarse breadcrumbs. Toss the walnut into the dry ingredient mixture, and create a small well in the center of the flour and butter mixture. Pour in the buttermilk/egg mixture, all at once, and use a fork to incorporate the ingredients. Make sure that all of the flour bits are moistened by the egg and buttermilk. Dump the shaggy dough onto a lightly floured work surface. Bring together, kneading lightly, until the dough forms a half-inch thickness, rectangular shape. (*note: The dough should not be overworked as may end up with a hard and doughy scones). 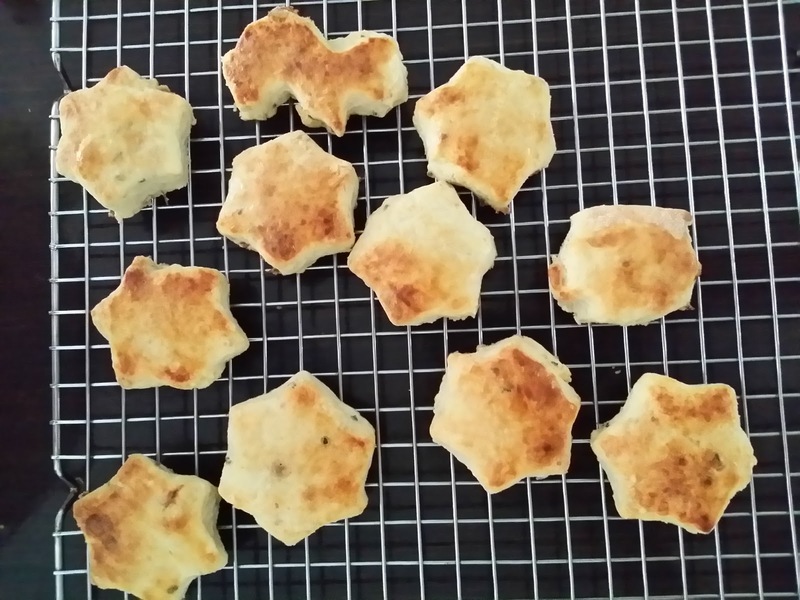 I used a star-shaped cookie cutter. Cut out the biscuits with lightly floured cookie cutter. Place them on prepared baking sheet and brush the tops with buttermilk and bake for about 10 - 15 minutes or until the tops are golden brown or until lightly golden brown on top and firm in the center. Cool the scones on a wire rack. 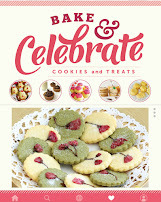 Serve split, spread with jam or low-fat spread. Scones are best served the day they’re made. 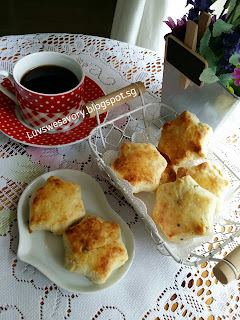 Loved these crusty scones with light and soft texture ... and a hint fragrance of lavender with every bite. I liked them to be served warm with some apricot jam and a cuppa ! Enjoy! 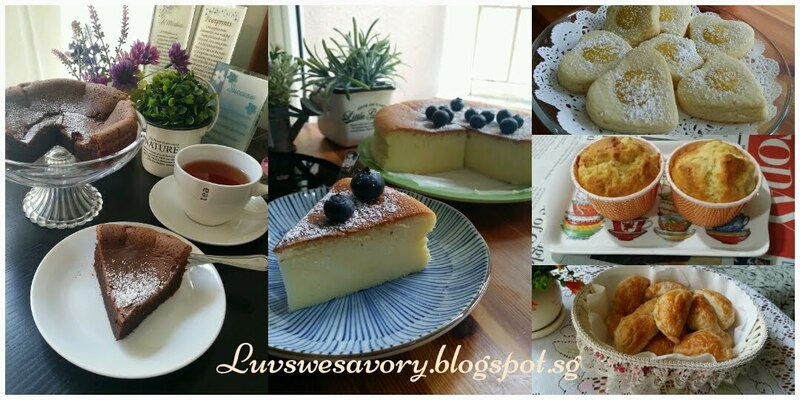 Happy baking and have a great weekend ahead ^-^! 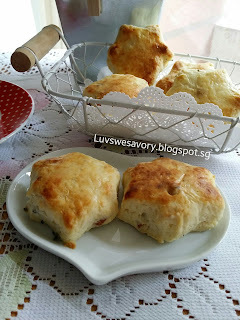 wow...these scones are baked with buttermilk, it will be extra yummy,ya. Hi Karen! 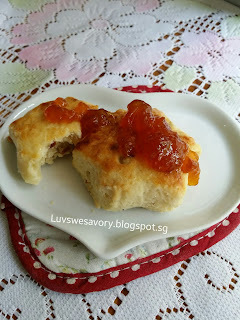 I love eating scones but my husband is not a fan of them, so I can't make them too often. How I wish I'm eating one of yours right now! Karen, I love scones and I bet your scones taste good and yummy!